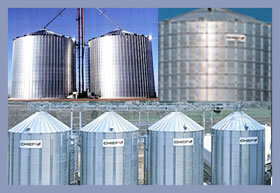 Chief Industries, Inc. manufactures grain equipment, catwalks, towers and bulk feed systems, commercial buildings and waste water treatment systems. The company began in 1952 as a small construction company in Grand Island, Nebraska, building and remodeling single family homes, and shortly thereafter became a dealer for farm buildings and grain bins. The plant in Kearney, Nebraska, is the agri-industrial branch of the company with approximately 230 employees. Some of Chief Industries' foreign buyers were having difficulty obtaining loans. Fortunately, Chief was introduced to EXIM Bank by Wells Fargo Bank and export-insurance broker International Risk Consultants. The two companies made Chief aware of the Bank's medium-term insurance which enables foreign buyers to obtain capital equipment and services with lender loans that typically have longer terms and lower interest rates since they are backed by the full faith and credit of the United States. Thus, the primary obstacle of repayment was solved. EXIM Bank's support has been a key factor in Chief Industries growing its international sales from 25 percent of total sales to 50 percent, representing a tenfold increase in dollars. The success has supported 45 jobs at the company. "Our trading partners were instrumental in helping us develop a financing model which has enabled us to provide EXIM Bank financing solutions to our valued customers resulting in significant sales growth. Your products help build relationships around the globe. Our buyers take pride in knowing they are getting international credit and take their repayment obligation very serious."